TENENBAUM PAPER CITY ADS DEC 2012_Layout 1 12/12/12 4:02 PM Page 4 MAY HOUSTON 2013 Editor in Chief HOLLY MOORE Executive Editor, Visual Arts / Social CATHERINE D. ANSPON Executive Editor, Fashion / Digital KATE STUKENBERG Photo Editor JENNY ANTILL Copy Director / Performing Arts Editor SHARON L. TAYLOR Assistant Editor, Features / Social SETH VAUGHAN Assistant Fashion Editor MEGAN PRUITT WINDER Editorial Assistant ERIN OPPENHEIM Style Columnist BILLY FONG Contributing Editors LAURANN CLARIDGE At Large DIANE DORRANS SAEKS Design RANDY POWERS Design GREG FOURTICQ Design CERON Style CAROL ISAAK BARDEN Travel MICHAEL DUPREE New York ERICA LEVIT Design JONATHAN LERNER Home / Architecture STEVEN HEMPEL Design / Features MATT ALEXANDER Tech Style DUTCH SMALL Design RYLAND HOLMES Style Production Manager REYNEL MIRANDA Art Director MICHELLE AVIÑA Junior Art Director ROSI RUIZ Graphic Designers GABRIELLE SAULS, CELESTE TAMMARIELLO Photographers CHRIS BROWN KIM COFFMAN FULTON DAVENPORT KENNON EVETT PHYLLIS HAND SHAU LIN HON JACK THOMPSON Interns BRIANNA MILLS MATTHEW RAMIREZ President JIM KASTLEMAN Group Associate Publisher MONICA BICKERS Houston Advertising Sales 713.524.0606, EXT. 231 Houston Advertising Manager MARY HOANG-DO Senior Account Manager, Houston CLAIRE BORMASTER Account Manager, Houston BRIANA BUXBAUM Dallas Advertising Sales 214.521.3439, EXT. 201 Associate Publisher, Dallas MARGARET STAFFORD Account Managers, Dallas MONET MERCER, MEGAN WELSH Houston Circulation Manager BRYAN DEAKTOR Human Resources / Accounting Manager MICHELLE REID Finance Manager / Business Support JAMES WORK TO CONTACT OUR STAFF VISIT PAPERCITYMAG.COM FOR A COMPLETE LIST OF E-MAIL ADDRESSES AND TELEPHONE NUMBERS Urban Publishers, Inc. 3411 Richmond Ave., Suite 600 Houston, TX 77046, 713.524.0606 Fax 713.524.0680 Editorial e-mail: holly@papercitymag.com Advertising e-mail: monica@papercitymag.com One copy of PaperCity is available free of charge each month per reader. Additional copies may be purchased for $3/each. No person may take more than one copy of each month's PaperCity. DIGITAL PRE-MEDIA BY FLYING PIXEL COLOR, HOUSTON PaperCity is published monthly by Urban Publishers, Inc. Corporate offices are located at 3411 Richmond, Suite 600, Houston, TX 77046, 713.524.0606, FAX 713.524.0680 Copyright © 2013 by Urban Publishers, Inc. All rights reserved without prior written permission of Urban Publishers, Inc. Urban Publishers, Inc. is not responsible for any unsolicited materials submitted. Mail service of PaperCity may be purchased for $36/city for one year. Mail check to: PaperCity, 3411 Richmond, Suite 600, Houston, TX 77046. 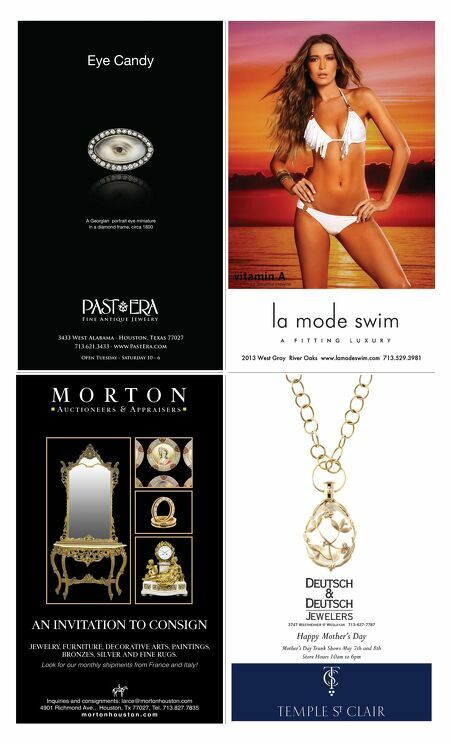 1801 POST OAK BLVD, HOUSTON, TX 77056 713.629.7444 www.tenenbaumandco.com ACTIVELY ACCEPTING TRADE-IN & BUYING JEWELRY & WATCHES WITH IMMEDIATE PAYMENT OSCAR HEYMAN 18K YELLOW GOLD, DIAMOND, AND SAPPHIRE EARRINGS. • OSCAR HEYMAN 18KT YELLOW GOLD, DIAMOND, • OSCAR HEYMAN 18KT YELLOW GOLD, PLATINUM, DIAMOND, AND EMERALD BRACELET. 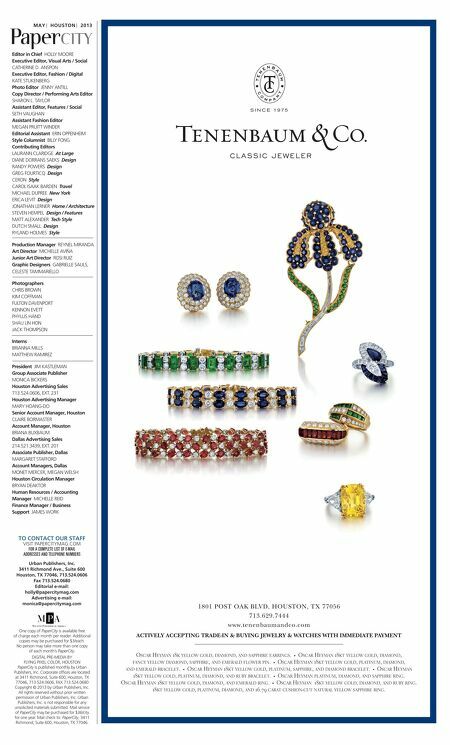 • OSCAR HEYMAN 18KT YELLOW GOLD, PLATINUM, SAPPHIRE, AND DIAMOND BRACELET. • OSCAR HEYMAN 18KT YELLOW GOLD, PLATINUM, DIAMOND, AND RUBY BRACELET. • OSCAR HEYMAN PLATINUM, DIAMOND, AND SAPPHIRE RING. OSCAR HEYMAN 18KT YELLOW GOLD, DIAMOND, AND EMERALD RING. • OSCAR HEYMAN 18KT YELLOW GOLD, DIAMOND, AND RUBY RING. 18KT YELLOW GOLD, PLATINUM, DIAMOND, AND 16.79 CARAT CUSHION-CUT NATURAL YELLOW SAPPHIRE RING. FANCY YELLOW DIAMOND, SAPPHIRE, AND EMERALD FLOWER PIN.